Through government advocacy and working with its partners to promote responsible regulation of the industry, the CNFA is the leading national voice to advocate on behalf of the fireworks industry. Consumer fireworks are a popular form of fireworks used for recreation. They include noisemakers, ground spinners, sparklers and aerial fireworks. Display Fireworks are fireworks designed to be used by professionals. These include items such as aerial shells, waterfalls, lances and wheels. Special effect pyrotechnics are a very technical and specialized type of pyrotechnics, designed to be used by professionals. They are often used in live production, film and television as well as sporting events. These would include items such as gerbs, mines, comets and crossettes. Its members are committed to regulatory compliance. 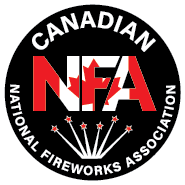 The CNFA’s mission is to promote fair access and safety in the sale and use of fireworks through public education, advocacy with regulators, and member compliance. The Canadian National Fireworks Association respects your privacy. We never sell, trade, or loan your information to any other organization. We will use your information only for follow-up contacts (such as our newsletters), statistical purposes, and to process and recognize your donations. By providing this information you consent to our collection and use of the information you provide.